Extend a VGA monitor up to 600 feet away from a computer.Also known as: VGA extender, cat5 monitor extender, remote monitor, extend video. 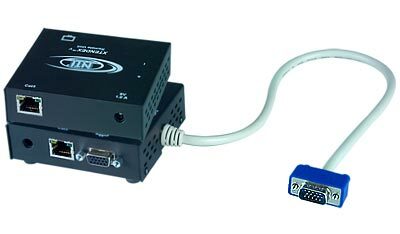 The XTENDEX VGA Extender extends a VGA monitor up to 600 feet away from a computer using CAT5 cable. Each video extender consists of a local unit connected to a computer or the output of an NTI switch, and a remote unit connected to a monitor or the input of an NTI switch. Access information from network servers. Use in-house CAT5 phone wiring to locate a monitor remotely. Push buttons on the side adjust video quality. Video quality adjustment for different lengths of CAT5 cable is done manually for video-only extender and automatically for audio/video or video/RS232 extender. VGA Monitor VGA only ST-C5V-600 3.5" x3.1" x1.2" 3.5" x3.1" x1.2"
VGA Monitor & Speakers VGA + audio ST-C5VA-600 3.5" x3.1" x1.2" 3.5" x3.1" x1.2"
Touch Screen VGA + RS232 ST-C5VRS-600 3.5" x3.1" x1.2" 3.5" x3.1" x1.2"